Vodafone and YOU Broadband have come up with joint fixed voice and broadband plans for their users in the Mumbai circle, confirming the acquisition of the latter by the country’s second largest telecom operator by subscribers. According to a pamphlet accessed by TelecomTalk, both the companies are offering four quarterly plans, namely BOLT 10 Mbps, BLAZE 50 Mbps, BOOSTER 50 Mbps, and BLASTER 100 Mbps. The BOLT 10 Mbps plan comes with Rs 2097 rental, and offers 45 GB data usage along with unlimited local and STD calls. The BLAZE 50 Mbps plans comes with Rs 2697 rental, and offers 75 GB data usage and unlimited local and STD calls. 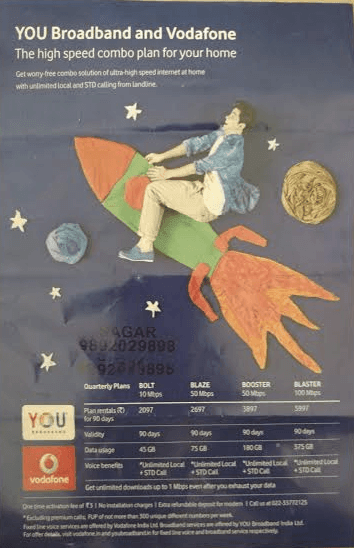 The other two plans– BOOSTER 50 Mbps, and BLASTER 100 Mbps—are priced at Rs 3897 and Rs 5997, respectively, and come with 180 GB and 375 GB data usage, besides offering free local and STD calls. While the fixed line call service will be provided by Vodafone India, the broadband services will be offered by YOU Broadband India. The pamphlet also reads that users will get unlimited downloads up to 1 Mnps speed even after they exhaust their data limits. The company is charging one time activation fee of Rs 3, while installation is free. Vodafone has started ruining you broadband plans, worst buy out ever for customers.